Opera tickets. Buy me opera tickets. As I’m typing these very words I’m listening to opera music on YouTube. I have the terrible feeling that one day someone is going to ask me what I’m listening to and I’m going to have to tell them that I have fallen in love with the opera and it now owns my soul. Sweet Briar, the program I’m studying abroad with, takes us out on excursions every so often to plays, and guided tours within Paris. A few weeks ago they took us on a guided tour of Opéra Bastille, the modern opera house in Paris completed in 1989. Contrary to popular belief, most operas in Paris are actually held at this new building and not the historical, Opera Garnier, which the Phantom of the Opera is tied to. Opera Bastille is newer and therefore has better acoustics and now holds the most operas while Opera Garnier shows more ballets. The Opera Garnier: fancy huh? Our tour was like a dream come true. Our tour guide took our small group of 5 people to not only the empty amphitheater, but to the “super-secret” side passageway that led straight onto the stage. 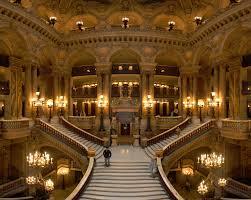 I went backstage at the Paris Opera. The crew on stage was currently working on moving all of the Nutcracker’s props onto one large square area, so that the elevator underneath could raise the entire square up so that the decorations could quickly be moved into one of the massive storage rooms that were also behind the stage and could move in the props for that night’s show. We walked around the sets for La Boheme and Don Giovanni and then he took us down to the 6th sublevel of the opera house where they store the oldest props and make the new ones for the coming seasons. Basically, the opera house is an iceberg. You only see that cute little top part and you have no idea of the monster that lies beneath. One of the questions I made sure to ask our guide was how to get cheap opera tickets. 1. Buy 6 months in advance: They start selling tickets for a piece about 6 months in advance, meaning if you want one of those 15 or 35 euro tickets, you need to act fast. 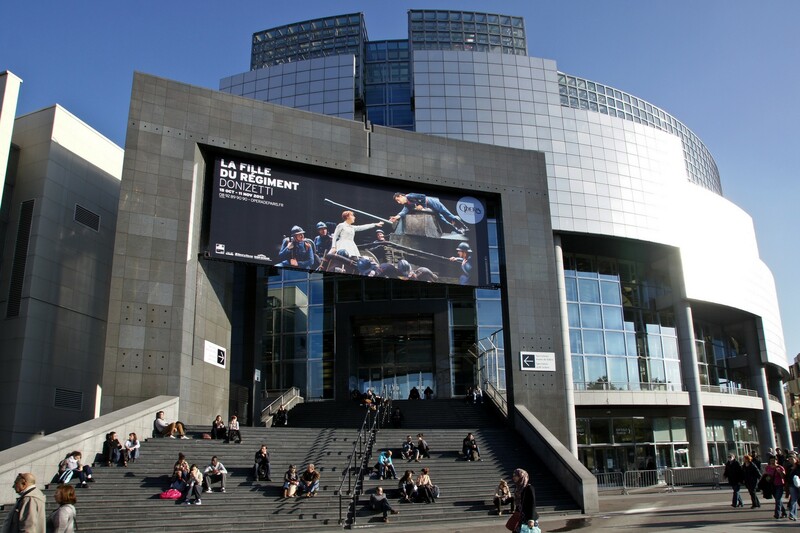 After I visited the Opera Bastille I waited for the ticket office to open and bought one of the remaining 15 euro tickets to see Swan Lake… in April. (The tickets went on sale mid-november and I bought mine November 22, just a few days after they started selling them) They’re not good seats, but hey, I’m guaranteed to see Swan Lake and for only 15 euros. 2. Super lucky young adult deal way: Last Friday morning I woke up as usual and was eating breakfast when I got a text from the opera. The opera texted me. Basically the text told me that there was a special deal for young adults (under 26) to see the opera La Boheme this Sunday at 2:30pm. They were selling tickets in the second best area of the entire theater that normally cost 180 euros for only 30 euros. Basically, I had a panic attack, woke up my friends with frantic phone calls and hurriedly purchased my ticket. Two hours later my friend decided to go as well and she scooped up the last ticket. Why did the opera text me? Because in order to purchase tickets online, or to even look at the prices for that matter, I had to sign up for an account on their website which asked me for my french cell phone number. So basically, I made that account about a week ago and I’ve already gotten one of these “Young Adult” deals. Who knows how often these deals pop up? My advice: get an account at operadeparis.fr as soon as you can in order to benefit from the 26 and under deals! 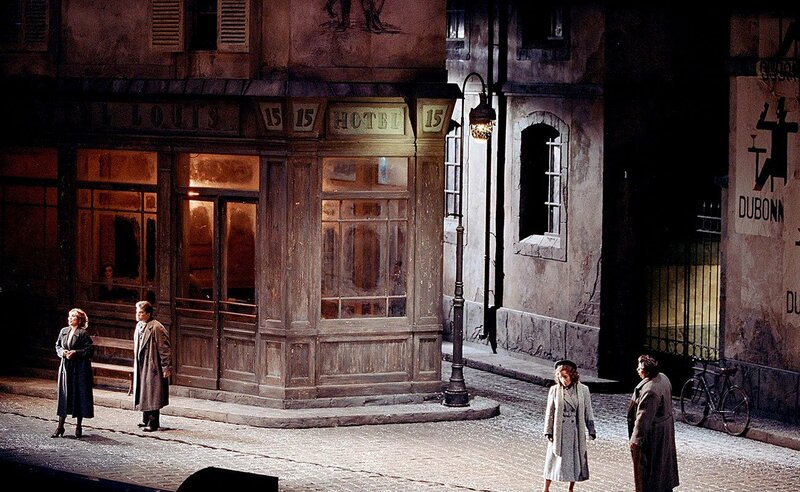 Oh and my seat at La Boheme: AMAZING. I was in row 7 of the orchestra, my friend: row 3. I could see the expressions on the actors faces! 3. Super-super risky/lucky way: Apparently if you show up an hour and a half before the show starts the opera will start to sell the remaining seats for 30 euros. (My tour guide told me this so it’s definitely a thing, but I haven’t tested it yet) In short: you might get lucky, you might not. Definitely have a backup plan in mind just in case your opera plans fail! Bohemian Paris of the 1800s, a story of love, and of course loss. Stupid tuberculosis. Also I walked through this exact set only the week before. All that snow? Tiny pieces of paper! I was actually shocked at how much I liked it. The vibrato in their voices really adds to the emotion you feel during the piece and I felt myself tearing up in the final act, when the main character laments the loss of his love. Thankfully, there were subtitles in both English and French, so I understood everything and I read the plot of the opera beforehand just to make sure. If you guys have any questions about the opera or how to get tickets leave me a comment!